Last Friday, I finished the week's web-logging with just a nice photograph. Since then, I've received loads of e-mails (where 'loads' = 2) saying that it was a great idea. So, let's try the experiment again! This week's 'end-of-week' image is also from the EISCAT receiver station at Kiruna. Like the other photograph, I took this while I was living there in 2006. Although cloud often masks out the beautiful aurorae, sometimes having some clouds is not such a bad thing. 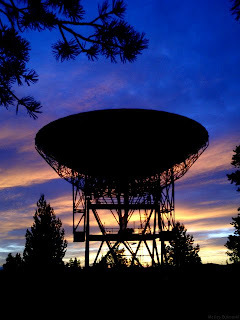 And radio-dishes always make for wonderful silhouettes.